A recent Boy Scout Troop 71 Eagle Court of Honor ceremony was held in honor of Vincent Benjamin Tomaselli, Peter Andrew Boyadjian, and Garrett Sean Byrne on achieving the rank of Eagle Scout. Leaders of Troop 71, elected officials, community leaders, family, and friends gathered to recognize the three Eagle Scouts’ achievements. Eagle Scout is the highest rank in the Boy Scouts of America, and is achieved by only 3 % of boys who enter Scouting. It is the culmination of years of commitment, effort and preparation. 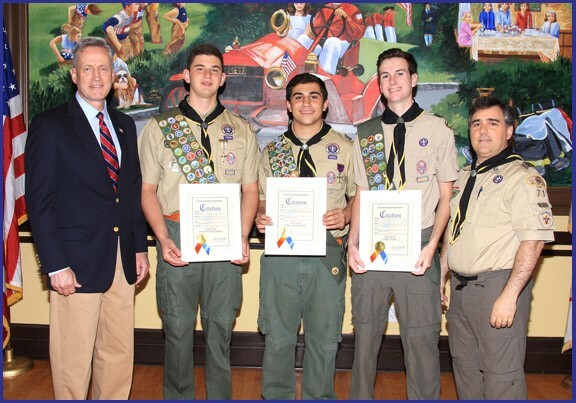 Shown in the photo above are (L-R):	Nassau County Legislator Rich Nicolello, Eagle Scouts Vincent Benjamin Tomaselli, Peter Andrew Boyadjian, and Garrett Sean Byrne, and Scoutmaster Chris Simone.